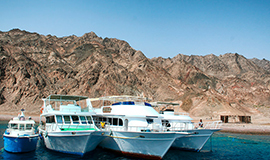 An exciting boat trip from Sharm El Sheikh to Dahab and back. An excursion full of attractive marine life and colors across two beautiful snorkeling stops. All rates are per person in USD. All optional excursions require a minimum of 06 persons, except if number of participants is previously agreed upon. Half day excursions do not include lunch, unless mentioned. Please check operation days for each excursion, as schedule may change without prior notice. No penalty charges if cancellation was made 48 hours prior to arrival. 100% charge applies if cancellation was made less than 48 hours prior to arrival.